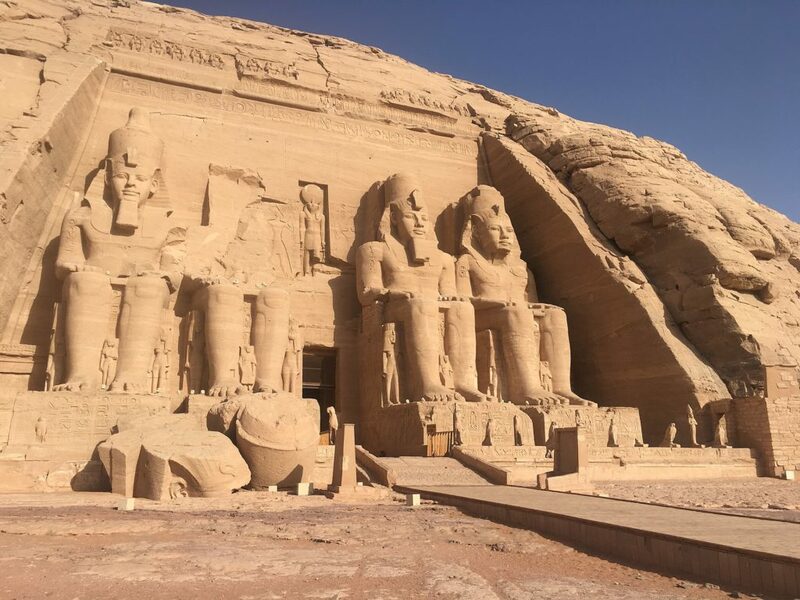 Four statues of Ramesses II at Abu Simbel. Wikipedia. The traditional date of the Hebrew exodus from Egypt is 1250 BC,* which would place it during the reign of Ramesses II, the greatest pharaoh of New Kingdom Egypt. Ramesses II is famous for his lengthy reign of sixty-six years, and for siring nearly a hundred children (between 48 and 50 sons, and 40 to 53 daughters). ** He is also remembered for his numerous military campaigns both against the Nubians in the south, and the Hittites to the north – and for being a signatory to the world’s first peace treaty. In another attempt at linking up Biblical with Egyptian history, people have also claimed that the Hebrews settled in the Nile Delta during the second intermediate period under the Hyksos, but then “there arose a new pharaoh who knew not Jacob” – perhaps this was Ahmose of Thebes, who reconquered the Delta around 1550 BC, reunifying Egypt, founding the New Kingdom – and enslaving the Hebrews, who remained in this condition until Moses led them out of Egypt some three hundred years later. point to a 1st millennium BCE date for the composition of the narrative: Ezion-Geber (one of the Stations of the Exodus), for example, dates to a period between the 8th and 6th centuries BCE with possible further occupation into the 4th century BCE, and those place-names on the Exodus route which have been identified: Goshen, Pithom, Succoth, Ramesses and Kadesh Barnea – point to the geography of the 1st millennium BCE rather than the 2nd. It is possible that a group of people that later merged into the Hebrew nation had Egyptian origins in the late Bronze Age, and whose story was elaborated and then incorporated into the overall narrative. But apart from some ambiguous references to the Habiru, no non-Biblical evidence has yet come to light about such a group. * Coincidentally also traditional date of the Fall of Troy. ** That a brand of condom was named “Ramses” seems hugely ironic. This entry was posted in Biblical History, Bronze Age, Egypt, Hebrews, Monarchy, Religion by jgood. Bookmark the permalink.